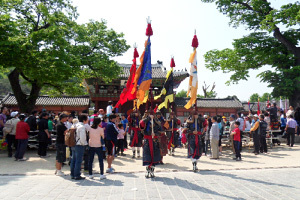 You can watch military training of courageous soldiers of the Jangyongyeong, royal guards of King Jeongjo, the 22nd king of the Joseon dynasty. 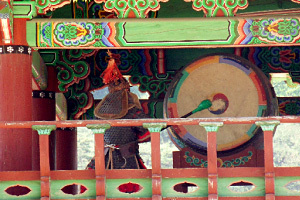 You can also meet the person who performs as King Jeongjo. 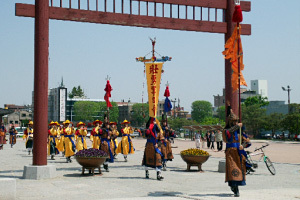 The ceremony is the Suwon city-specific cultural commodity symbolizing Suwon, time-honored city. contents : Military etiquette ceremony, suwi ceremony, photo time with King Jeongjo, etc. 2. 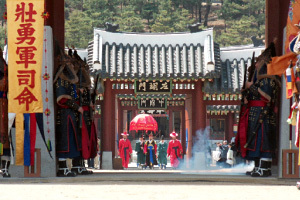 Entry of Jangyongyeong soldiersJangyongyeong soldiers leave Namgunyeong for Suwi ceremony. 3. 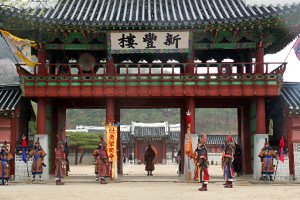 ChoeomThe procedure where Jangyongyeong soldiers are ready for suwi disposition to keep the fortress gate, following the order of Seonjeongwan. 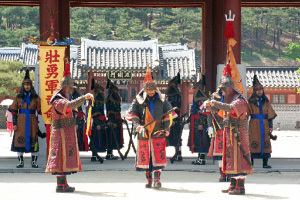 4.JungeomThe procedure where the general of Jangyongyeong gives suwi order to his soldiers. 5. SameomThe procedure where Byeongjo Panseo (Defence Minister) sends down the royal order to Jangyongyeong soldiers. 6. 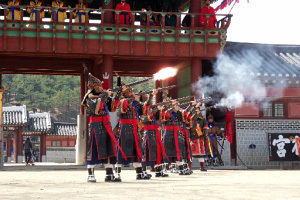 Entry of Jangyongyeong soldiersJochongsu, or rifle shooter, gungsu, or archer. enter for military training. 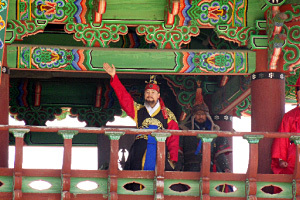 King Jeongjo visits the camp to watch military training. 9. GeumeomThe procedure where, after the gate is opened, all the people are checked and controlled. 10. 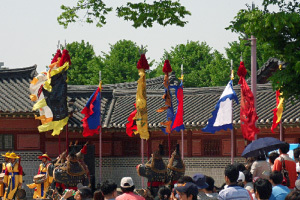 Sanggirae(Flag-Rising ceremony)Military etiquette procedure where soldiers of each military camp raise the camp flag to report to the king that they attend the training. 11. Military etiquette training -1 (giving order)Giving order – the ceremony where the general of Jangyongyeong orders his soldiers to be mentally alert. 12. Military etiquette training -2 (demonstration of jochongsu)Jochong shooting demonstration of jochongsu. 13. Military etiquette training -3 (demonstration of gungsu)Archery demonstration of gungsu. 14. Praise of the kingThe ceremony where, after the training, the king praise soldiers. After the king returns to the palace, the fortress gate is closed. 17. Hagirae(Flag-lowering ceremony)When the military training is over, the raised flag is lowered, and is returned to the camp. 18. 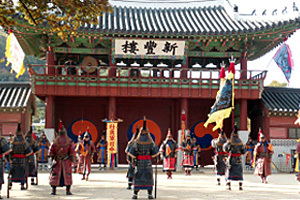 Heeom ceremonyThe ceremony where, after finishing all the procedures of the event, Jangyongyeong soldiers end all dispositions, and gather together. 19. YepilWalking out of Jangyongyeong soldiers. To know more about the performance, visit the website of Suwon Cultural Foundation.